Relieve and release the stiffness that comes from prolonged sitting—at a desk, behind the wheel, or on a meditation cushion—with these easy-to-follow exercises. All meditators know the discomfort of cramping joints and aching backs. Free yourself from pain with this beautifully illustrated guide. The book is organized anatomically, helping readers to immediately focus on the part of the body that causes them pain: tense shoulders, stiff knees, sore hips, etc. Sit with Less Pain also includes instructions for flowing series of movements, which combine several exercises into smooth sequences, for readers who have mastered the individual stretches and want a more intensive experience. Gorgeous, clear illustrations and lay-flat binding -- which lets the book stay open at the proper page -- will help readers perfect the poses. Jean Erlbaum, M.S., E.R.Y.T., L.V.C.Y.T, author, has been studying yoga and meditation since 1965 and has been teaching since 1972. An Experienced Registered 500-Hour Yoga Teacher, she is certified as a teacher of several styles of yoga, meditation, and stress reduction. She has studied Zen for over thirty years and in 2012 was designated as a senior Dharma teacher by Boundless Way Zen (Worcester, Massachusetts). She offers classes in Greenfield, MA, and Naples, FL, where she lives with her husband Richard Rumelt and their two daschunds, Stella and Oscar. Richard and Jean have two daughters, Anna and Libby, who live in New York City. For more information about Jean, her classes and media resources, please go to www.yogaforrelaxation.org. "Learn to sit in contemplative practice longer and translate simple yoga movements into creating ease in daily, routine tasks like sitting at a desk. Jean Erlbaum's well-informed book is straightforward and clear, with just enough detail for nonexperts." "A very useful book, which could benefit many who aren’t confident about attending formal yoga classes, yet who need help dealing with the inevitable aches and pains. I was pleased to see that the figures in the illustrations resemble normal people of various ages, both sexes, a variety of races, and with normal body types." "A true blessing for everyone who has a body." "Not only do my eyes see the beauty in this much-needed book for meditators and anyone who sits on any chair, my heart is happy that we finally have this well-mapped-out guide. Thank you Jean!" "Whether you spend your days in the temple or in the boardroom, Sit with Less Pain is the perfect companion guide to remaining comfortable and pain-free. A must-have for everybody who sits!" "This book should be required reading for all meditators to nourish and protect our bodies as we do the physically demanding (and rewarding) work of meditation." 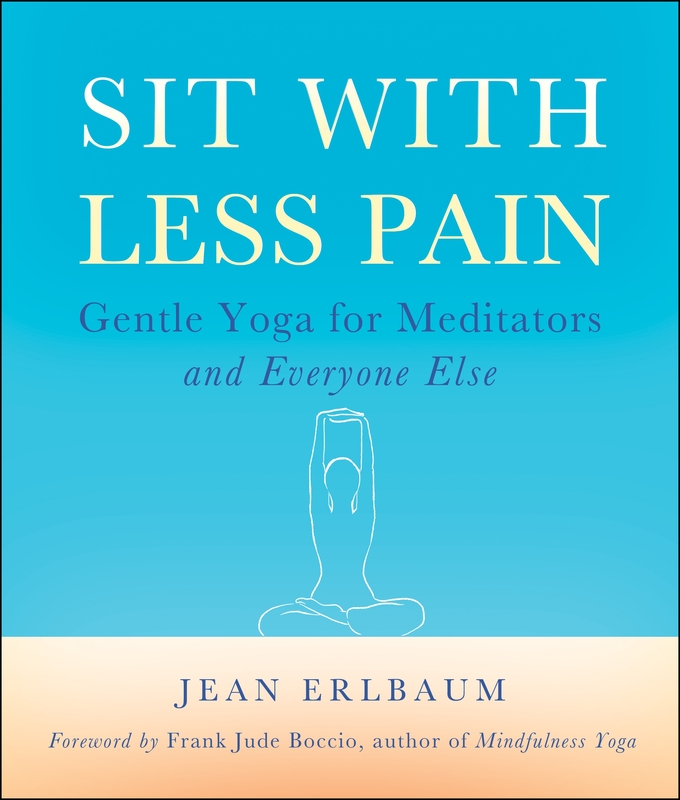 "For one whose decade long yoga practice was what first offered the invitation into the world of meditation, I am grateful to Jean Erlbaum for this wonderful and beautiful book that demonstrates, with superb illustrations, the intricate connections of the body mind."